Festival Color Azerbaijan 2017 will once again be held this summer on the Caspian Sea shore, KHAZAR ISLANDS on July 1-2. The event is organized by TS EVENTS - You Only Live Once, by TS and Azsound companies, Trend Life reported. The festival promises a colorful entertainment program, featuring contests, disco and a salute. "Dear friends, you will have two unforgettable summer days on the KHAZAR ISLANDS - Festival Color Azerbaijan 2017. Tons of colorful powder, thousands of happy faces and fun for everyone. We will prepare for the Festival together," the organizers’ message reads. The Festival of Colors is an open-air event modelled on one of India's most ancient and colorful customs - the Hindu Holi festival. It’s about the triumph of good over evil. The event is enjoyed by millions of people all over the world. The key ritual of Holi is the throwing and applying of colored water and powders on friends and family, which gives the holiday its common name “Festival of Colors.” It's the way of carrying the message of love and happiness across walls, neighbors, and hearts. 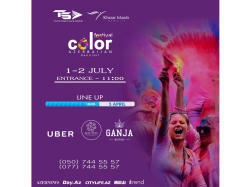 So don’t miss the chance to celebrate the annual Color festival! The sale of tickets (STAND UP, STANDARD, VIP) will begin on April 5. Tickets can be purchased at GANJA BISTRO and BOUTON FLOWERS BOUTIQUE.